A team of students of the Faculty of Engineering, State University of Yogyakarta (Universitas Negeri Yogyakarta/UNY) creating an automatic ultrasonic sensor-based train doorstop named 'Papinka'. 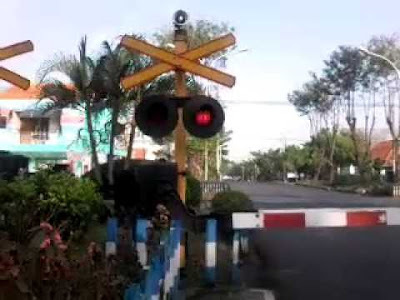 "Papinka is an automatic train doorstop prorotipe equipped with a countdown to provide information and early warning to road users who will pass the railway crossing," said the team coordinator, Dimas Imaduddin in Yogyakarta on Friday, October 23, 2015. According to him, the device is controlled by a microcontroller that got the "input" of an ultrasonic sensor mounted on the "gate" at a certain distance before railroad crossings. "Input" provided an ultrasonic sensor in the form of the train's speed and length. "The input is then processed by the microcontroller to get train arrival countdown towards the rail crossings and will move to the bottom bar and the display counting backwards time in seven segment mounted on the doorstop crossings," he said. He said the device displays the time counting backwards so that road users can estimate the expected closing time of the doorstop railroad crossings. Thus, the user can stop comfortably and safely. With the tool, he said, is expected to reduce the rate of accidents on railway crossings. In addition, it can also help guard the railway track at the time of charge and can reduce the risk of accidents due to negligence of railway crossing guards.